There is a growing awareness of what effect light has on our mood and our wellness, and growing trend of using light in design across the industries. In February our applied color psychologist and CMF specialist Grace Boicel participated two exhibitions in London with the focus on light. In this post, Grace will reflect the light being a future trend. Light is an important factor in my work. To fully understand how to use colors, it is important to understand that color is visible light. Light reveals itself in exciting new ways and effects in different elements. The key elements that interact with light are surfaces, materials, shapes and forms. Our emotions trigger from the way we interact with materials, shadows and spaces. 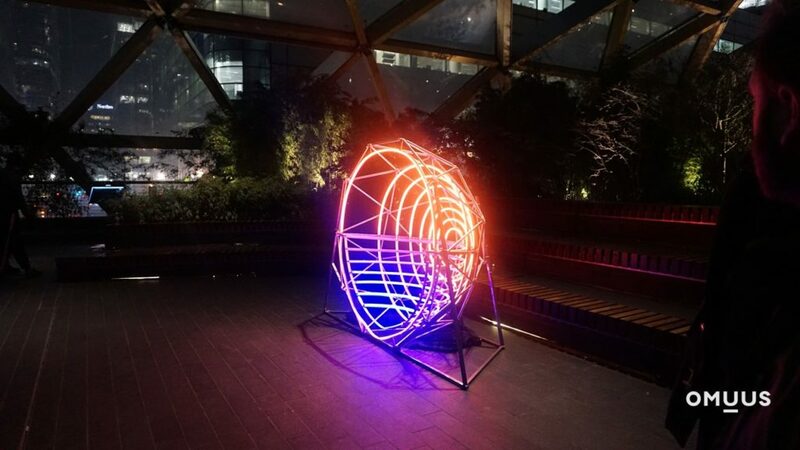 I started the year by visiting Canary Wharf’s Winter Lights Festival 2018. The exhibition consists of 33 light and art installations set by artist around the globe. Artist present their work in different forms of light technology in one of the two main financial districts in east London. It is something truly magical when you combine visible light, movement and sound. Interaction and immersion were key features of this year’s exhibition. Good example of sensorial experience with light, was interactive light sculpture and music composition. It is controlled by your mind, via an EEG headset. The electrical data from your brain controls the music and creates complex light patterns. In other words, your brain illuminates over 30,000 LEDs. Artist Marcus Lyall collaborated with Robert Thomas, who created the adaptive music. Malgosia Benham’s cube allows you to use your body to create shadows in a range of different colors. This is an exciting way to explore the mixing of colorful shadows through interaction. Creating shadows in three different colors – cyan, magenta and yellow. Unexpected color combinations will appear, when you block the light source to create your own shadows. The ephemeral magic of light, material and movement. Jetske Visser and Michiel Martens have been experimenting reflecting materials by using long strips of foil, like transparent foil combined with simple spinning motors. This becomes a visual entity reflecting the lights around them like water drops. Another example of working with reflecting materials was Fenella’s glass and light installations using translucent optical film. The film further alters the reflection and refraction of light within glass. Light has a remarkable impact in the emerging trend of combining art and science. This kaleidoscopic light-wall by Jessica Lloyd-Jones explores energy and optical phenomena through the creativeness of holographic colors and patterns. These colors and patterns change dynamically, when observed from different angles. This was also visible in Joachim Slugocki complex paintings. He uses the science of light by applying UV light, to make the paintings glow in the dark. ARCHITECT@WORK is a two-day worldwide trade designed for architects and designers in London. Naturally light has a huge impact in architecture. Light is temporary and uncontrollable as it moves and flows in our spaces. It delimits areas creating different moods. 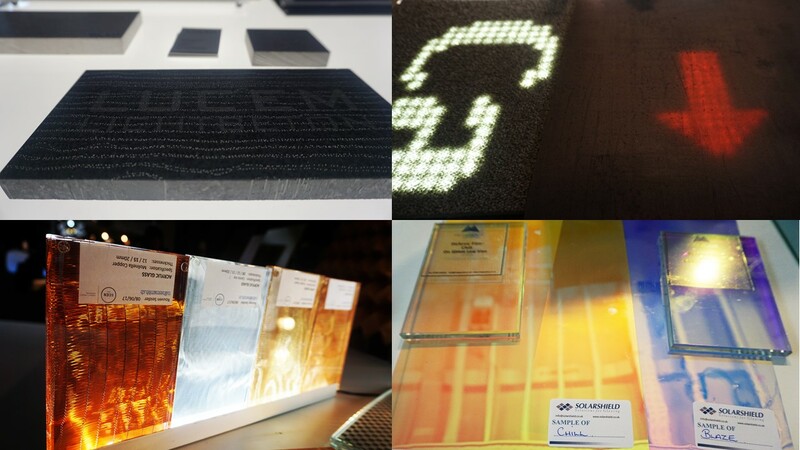 SCIN had organized an exhibition about the medium of light being a tangible material. They provided an enlightening journey of light and darkness interacting with materials. Materials can transmit light by using fibre optics or filters. Certain materials can transform light into energy. Using fine glass granules, we could discover how materials reflect light. It was also interesting to see, how diachroic films make spaces more luminous. Light can also be absorbed into absolute darkness, like the patented blackest Vantablack. For example, translucent ceramics and glow in the dark bricks play with light, to create interactive spaces. Lucem light transmitting concrete. 2. Luminous carpets 3. SEEN GmbH acrylic glass and metallic inserts. 4. 3M Dichroic Film creates a myriad of color. There is no doubt that light has a great impact in our daily life – health and well-being. We in Omuus are eager to continue grow our knowledge in this area. We want to understand more deeply the ways how light reveals itself and creates mood changes.